Andrew Waterworth scored both goals as Linfield beat Tobermore United 2-0 in the Irish Cup fifth round tie at Fortwilliam Park. The Blues striker followed up to claim the final touch for the first goal in the 25th minute after his initial header had come off the bar. Waterworth drilled in the second goal nine minutes from time after the hosts had failed to deal with a corner. 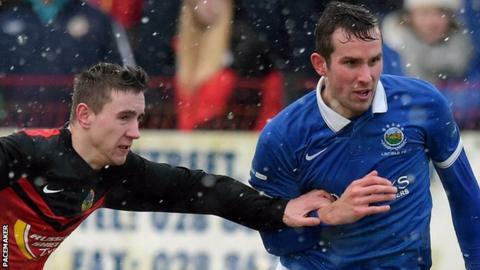 Chris Casement scored Portadown's extra-time winner away to PSNI. Gary Twigg gave the Ports an early lead with recent signing Kyle Agnew equalising for the Championship One outfit in the 24th minute. Defender Casement made it 2-1 to the Premiership side with a 25-yard direct free-kick in the 110th minute. In an incident-packed tie at Seahaven, Portstewart beat Dundela with both sides ending with nine men. It was 2-2 at half-time after Johnny Stewart had scored both goals for Portstewart and Aaron Keenan and Jamie Jackson had netted for the Championship One strugglers. James Peden scored a 59th minute winner for Portstewart. By that stage Timmy Clarke of Dundela had been shown a straight red card. His Duns team-mate David Gibson was sent-off in the 70th minute and there were late dismissals for Portstewart duo Richard Vauls and Conor McNamee. In the other early kick-off, goals by Ryans Deans and Mark Armstrong have H&W Welders a 2-0 home win over Derriaghy Cricket Club.